It seems like life goes smoothly and then something comes along that makes you think about various things of which one, at my age, is mortality. I do know that at the age of 80 I am still standing and that is what counts so when I wake up in the morning I look forward to another good day not worrying what it will bring. There are many things I look forward to such as eating out and trying new places. This past month I hit a few familiar good places such as the Quarterdeck, one of my favorite restaurants (see #14--their Jambalaya), along with the IHOP (#13) and The Cheesecake Factory (#12) Depending what movie house we go to on Friday we will either have a bite at Sweet Tomatoes (#16) or Subway (#11). In addition whenever I can get a groupon for a new restaurant I grab it and in October got to go to Siam Cuisine (#15), Filling Station (#19), Salsa Fiesta (#10) and Flash Fire Pizza (#9) which I have or will post reviews. Also revisited the Sea Club (#s 17 & 18) as Allen’s friend Neil came in for a week from Germany and it is a nice ‘tourist spot’ right across from the beach. Somewhere I have in the back of my head that if I don’t go to the movies on Friday the world would come to an end so with that thought I saw 4 movies on Fridays and 2 on Tuesday of which I really liked The Martian (#4) , would see Freeheld (#3) again and enjoyed Bridge of Spies (#1) while the other 3 weren’t worth the time except for Sandra Bullock’s (#2) performance in Our Brand is Cruising. 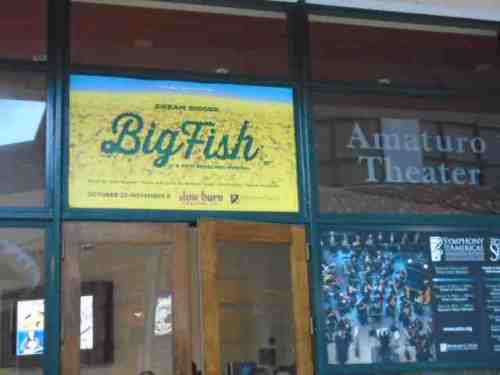 The theatre 2015-2106 season officially started with an excellent musical called “Big Fish” based on the movie and book version. Next comes “Newsies” a show I have seen and really liked before. Among the good news was the makeover of our library (#21) and the availability of computer lessons to the residents here at Gateway by a computer whiz Christopher--more about that in another post--and I might look in as he is working with Microsoft 10. After a decade plus of being the mailman here Mark (#20) died. He was more of a friend to all of us than a mailman. And, of course, last but not least, I had carotid artery surgery done to clean the plaque on October 19---one of the ceiling panels in the pre-op room--(#s 22 &23) giving me a beautiful scar for Halloween!! Now I look forward to November and all the month will present to me--the good and/or the bad.